The wrong program comes up when Nathan3 double-clicks a photo. He asked the Answer Line forum for advice. Whether you've double-clicked on a picture, word processing document, or spreadsheet, Windows uses file extensions to know what program to open. For instance, I'm right now working on a file called "August Answer Line.docx." On my main computer, the extension docx tells Windows to load the program into Microsoft Word. But on the family netbook, it points Windows to OpenOffice. Windows knows what program to open because the extension is associated with a particular application. Program installations often change these file extensions, not always for the better. 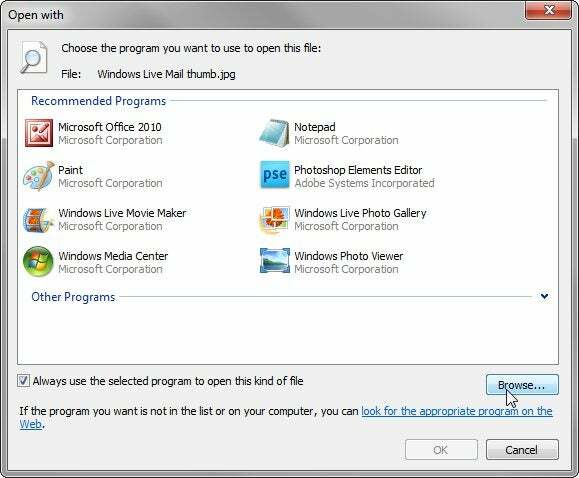 If you're using Vista or Windows 7, right-click a file of the type you want to reassociate and select Open with, then Choose Default Program. If the resulting dialog box displays the desired program, double-click it. Otherwise, click Browse to find the right .exe program file on your hard drive. The technique is slightly different in XP. Right-click a file of the type you want to reassociate and select Open with, then Choose Program. Check Always use the selected program to open this kind of file. Then, if you see the desired program, double-click it. 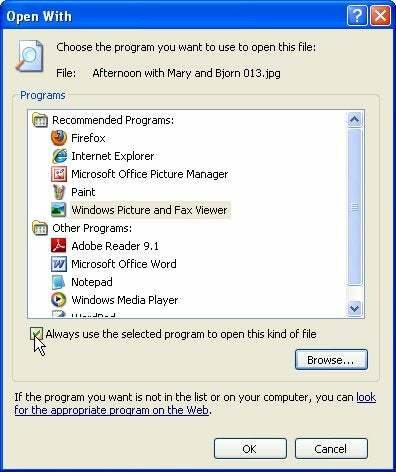 If it's not there, click Browse and find the right .exe program file. In XP, Vista, or Windows 7, if you can't find the right .exe program file, keep the dialog box open as you click Start and find the program on the Start menu. Right-click the shortcut and select Properties. On the Shortcut tab, select the complete contents of the Target field, then press Ctrl-C to copy the contents to the clipboard. Back in the "Open with" dialog box, click the 'File name' field and press Ctrl-V.